Double crochets are like the long version of single crochets! 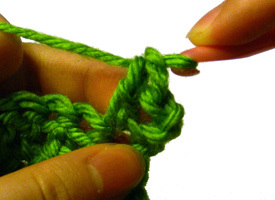 If you are just beginning to learn how to crochet and have not learned single crochets yet, I would suggest learning how to crochet single crochets first. After that double crochets will be a piece of cake! If that doesn’t makes sense that’s okay! Here is a picture tutorial of what to do. This tutorial is for both right and left handed people. For left handed pictures, roll your mouse over the image and it will change for you. First I’m going to start out with a small swatch. 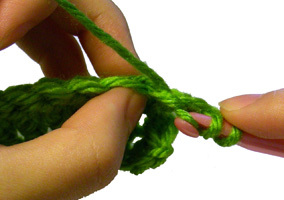 Just use a piece of work you want to practice your double crochets on. You can even start out with a chain as long as you desire. Note that when you make a new row of double crochets you must chain 3 before starting your double crochets. This ensures that the beginning of your row will be the same height as the rest of your row. 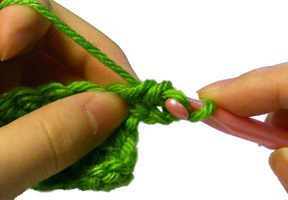 Step 2: Insert your hook into the stitch you want to make your double crochet in. 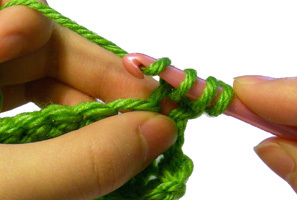 Step 4: Pull the strand of yarn through 1 loop on your hook. You should now have 3 loops on your hook. 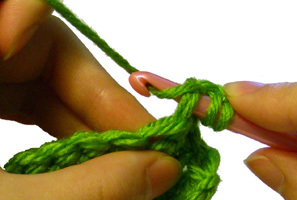 Step 6: Pull the strand of yarn through 2 loops on your hook. You should now have 2 loops on your hook. 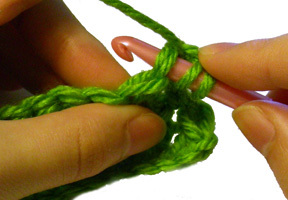 Step 8: Pull the strand of yarn through 2 loops on your hook. You should now have 1 loop on your hook. Congrats! 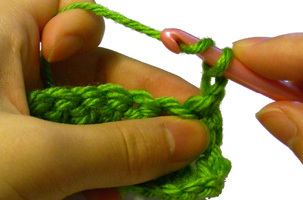 You just complete one double crochet stitch! 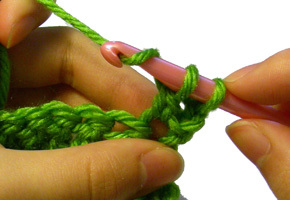 To make more stitches repeat steps 1 – 8. 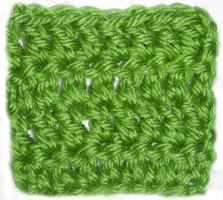 The picture at the top of this page shows you what a few rows of double crochet look like. If you need more help, just let me know by leaving a comment and I’ll be glad to help! This entry was posted on Sunday, May 24th, 2009 at 12:00 AM by Rachel Choi	and is filed under Tutorials and Help. You can follow any responses to this entry through the RSS 2.0 feed. You can leave a response, or trackback from your own site. You will make 1 dc into each of the next 2 dc. Then you will make 2 dc in the next dc (this is an increase since 2 dc are being made into 1 dc). Then you will repeat all of the instructions with in the parentheses ( ) a total of 6 times. So you will be doing dc in each of next 2 dc, 2 dc in next dc, dc in each of next 2 dc, 2 dc in next dc ,dc in each of next 2 dc, 2 dc in next dc, etc.